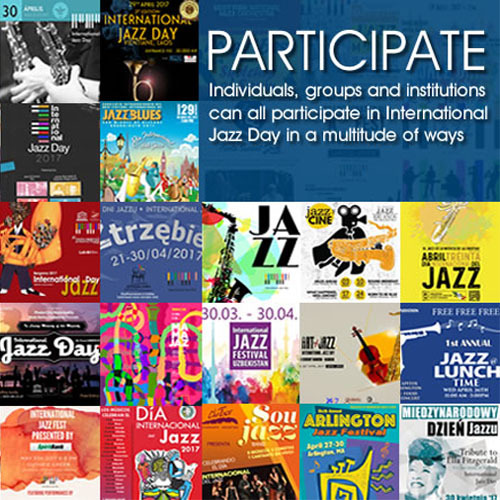 There is a moment on Dizzy Gillespie’s “Con Alma” that was played by the Michel Camilo Trio at the 39th Internationale Jazzwoche, 2008 in Burghausen, Germany when music is heard at its purest. There are several of these, of course, during Michel Camilo’s baroque introduction, which is brimful with glorious glissandi and Florentine arpeggios, but the moment of utter purity comes when Charles Flores begins to play. It is the fifth note he strikes about 1m 52s into the piece. The note is held for a couple of seconds as Flores appears to meditate on it. So deep does Flores delve into his own soul that the note appears to hang on his very heart-beat. The note is not quite round; somewhat elliptical, It rises and before it can fall, Flores applies that little touch of feeling to the string that the death of the note is delayed just that little but so that it resonates not just in the ear but in the very heart of the body—everybody in that house in Burghausen—that listens to it. It flushes the mind of all clutter; almost all thought so that it can occupy the senses, moisten the breath and shut the eye as the soul is bared and is lifted up into a heavenly space. That note could not be replaced with any other and Flores has found it. More than anything else it is, as Flores discovers, a note worth risking his life for. He knows that this is it and that is why he holds onto it for just that very extra second that it is about to fade and die so that the song might go on. Michel Camilo knows it too and he too delays the onset of Dizzy’s masterpiece. After all Gillespie’s instructions were to play the song “with soul”. So Camilo must follow the instructions as well and he delays the next note just that fraction of a second to allow for Flores’ note to grip tightly at every heart. As the piece progresses, Flores plays single notes, up and down the scale. Every note is fraught with possibilities. The scale could go anywhere he chooses, but Flores sticks to the vertical movements of notes; going up and down the scale. His notes are contemplative. As he moves up and down the scale his tempo remains the same. It is brooding and hypnotically meditative, but not dark. His “soul” is uplifting as his notes are. Flores seems to suggest, with his playing, of course, that he is celebrating life. His ebullience is contagious. Camilo is the first to be smitten. 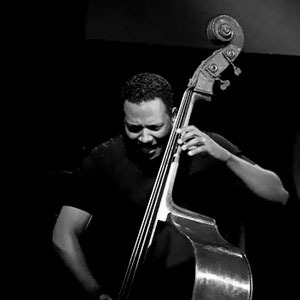 Conscious of every note that Flores has been playing, Camilo cracks a rare smile as he plays block chords, harmonizing with the bassist and taking Dizzy’s great song forward. He plays the ten-note line; and uses glorious chords to announce the elevating melody. At every turn Flores follows suit with the most elementally beautiful harmonic cycle heard in the deepest part of the bass register. Charles Flores is a bassist with a singular voice. 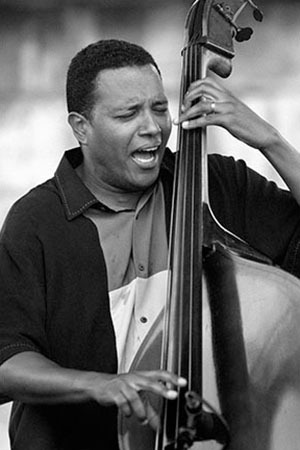 He comes from the same school that produced Blanton, Mingus and LaFaro; Oscar Pettiford and Ray Brown. Flores plays with succinct intonation. His notes somehow seem fat and well-rounded. His fingers reek of harmonic ingenuity for each time he plucks at a string, the note shows itself in a three dimensional manner and more than that, as the note rebounds to rest, it seems to trigger off a hail of ghost notes that follow it to rest. As the line he plays progresses in this manner, a halo of notes appear to emerge from his fingers. Flores has fashioned them into an ellipsis that rolls out in harmony with the notes of the melody. Thus his lines appear to move in an elliptical manner, up and down the neck of the bass, his long fingers gripping and releasing the strings to give them life. Michel Camilo repeats the melody after playing a florid little interlude. Flores now doubles up the notes, He plays the root note of the harmonic progression and then follows that up with the loudly enunciated ghost note in the wake of the first note that he has just played. Camilo is emboldened by this approach. He allows his mind to run free now and plays a series of chords and notes at the same time. 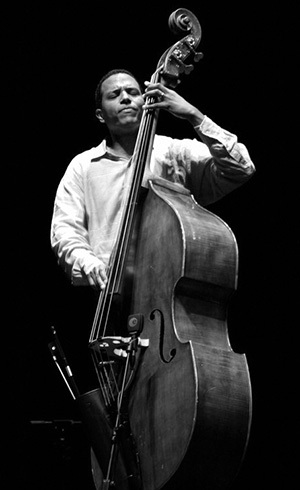 Flores replies with an intricate line that traipses up and down the neck of the bass. Now Flores cracks a smile. He has hit his stride and is now one in spirit with Michel Camilo and drummer Dafnis Prieto, who has been lurking in the not so distant shadows playing his skins with brushes in both hands, having exchanged the stick in his right hand for a brush as well. Now the song hits full stride and opens itself up for the soli. It is the turn of Michel Camilo and he strides forth. Flores opens up his bass to. He plucks harder and with mighty soul. The sound of the bass is woody and the notes are verdant. It is as if the musical venue has been magically transported into a place of immense lushness. Flores seems to be enjoying this environment. He romps and lopes like a gazelle that has the smell of rain in his nostrils. In Flores’ case it is as if the heart of the piece has suddenly been revealed to him in the inner recesses of his mind. His playing gets freer and his notes get more pronounced and rounder as the lines make magical leaps from one elevation to the next. At one point, around 2m 42s into the song, Flores becomes dangerously adventurous, using mighty leaps and bounds seemingly out of the harmonic ballpark. Charles Flores was born in Cuba in 1970. When he was a mere ten years of age, he took to the bass, fascinated by the tone and texture it brought to music. But it was the era of Fidel Castro and Flores’ favourite music—jazz—had to be listened to surreptitiously. But he grew in strength. During his Senior high year, Flores joined the ensemble fronted by the great pianist Emiliano Salvador. Flores later toured with that group in 1992 and 1993. He then joined the Isaac Delgado Group and appeared on several of their albums. His yearning to play jazz overcame him and he arrived in the US as a refugee, settling down in Hartford Connecticut to live with relatives of his wife, Mariam. In early 2000 he joined the group of Michel Camilo and proceeded to forge a great relationship with the Dominican pianist. The soul connection is evident even more now. Camilo drives the song deep into the territory of the soul with beautiful and splendid runs and arpeggios. Flores dives straight into the vortex created by the music. His heart is completely overcome. Now the bassist repeats the original figure that he had harmonized in the first verse. The song ten-note cycle is repeated by Camilo and Flores is right by his side. His bass sounds heavier and the notes are thicker. The woody sound seems to go to his head and Flores closes his eyes tight as he savours the notes like succulent fruit. They are fatter, rounder and the cycle is once again elliptical. Now Flores finds his body also smitten with the song. He approaches the song waving his head from side to side. The rest of his body follows suit as the song enters his body consuming the bassist completely. Now the same notes that he had played are not only played from his heart but from his whole body as well. He sways as if possessed. Camilo knows that and rolls along. Half-way through the song, Flores introduces a run with a myriad of notes and one that is punctuated by double stops and a blazing ostinato passage. He throws his head back and shuts his eyes tighter as he now rolls the harmony in a crazy whirl around Camilo’s melody that gets more elaborate and beautiful. His bass notes stutter and stammer in throaty growls. In its third pass of the chorus, Flores leads the way until Camilo moves towards bringing the song to a close. Dafnis Prieto returns to his brushes, Camilo begins to play a four-note figure he pulls out of his head and it sticks to the song’s melody like a burr. The pianist likes that and so does Flores. The bassist recognises that Camilo is bringing “Con Alma” back home and his notes become brooding again. This time he plays just four notes over and over again, employing rich dynamics, double stops and all manner of florid expressions to the short phrase. Camilo actually sheds a tear at the end of the song. The souls of the musicians are bared for all to see, especially that of Charles Flores. Yet that was not the highest point for the bassist. Nor was the Grammy award that he had won with Camilo and Horacio Hernández in 2005 for their record Live at the Blue Note (Telarc, 2004). He played again, this time with Elio Villafranca and lastly with Prieto, in the second decade of this century. Those tapes have not yet been released, but when they are, Charles Flores will surely begin to live again.